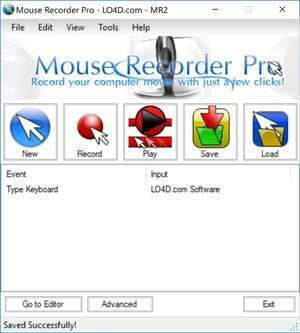 Mouse Recorder Pro 2 is a free mouse and keyboard recording application which will record your PC mouse and keyboard input, allowing you to repeat an operation easily and fast. this software download allows you to easily play the recorded steps made when installing or working with a certain application. You are also able to edit and set the repeat time of your recordings. You can play what you have been recording in a scheduled time you set. Version 2.0.7.6 is a freeware program which does not have restrictions and it's free so it doesn't cost anything. For security reasons, you should also check out the Mouse Recorder Pro 2 download at LO4D.com which includes virus and malware tests. Additional screenshots of this application download may be available, too. 4 out of 5 based on 12 ratings. Mouse Recorder Pro 2 has a presence on social networks.